Roller Skating.....IT’S FUN YOU CAN FEEL!!!!! Roller skating is the perfect way to combine fitness with fun, keeping this in mind WIS every year organises a skating camp for a period of one month for the Jr. KG and the Sr. KG section. This year also from the 4th of March ’15 to 31st of March’15 Jr. KG C and D and Sr. KG C, D and E had their skating camp where in the children were constantly observed, encouraged and supported by their coach’s to gradually progress through varying levels of challenges which would help them build up their confidence as they skate along. Children started with the basics and finally tried out more skills like varying their speed and stopping safely. A day to display their skills was organised on the 31st of March’15 where in the parents were invited to watch their kids display their skating talent. We love to say them atleast once, maybe twice. Put me on the stage and I would love to say them all day long! 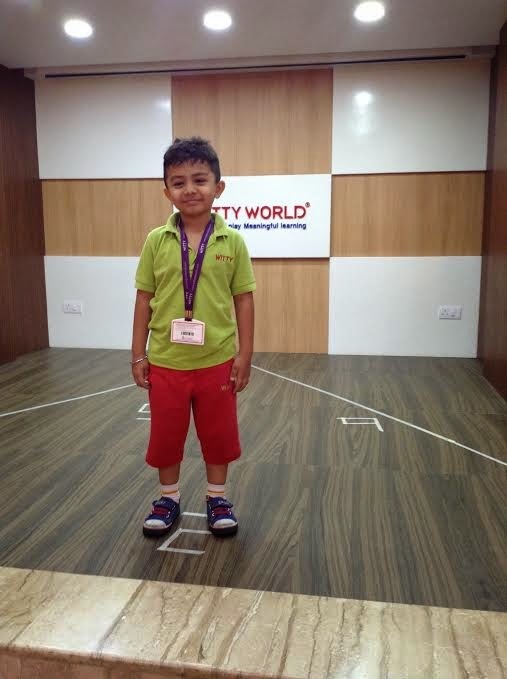 The Jr.kg children at Witty World participated in a poetry recitation activity at school. The children came prepared with any one of their favourite poems and recited the same on the stage in the mini auditorium. 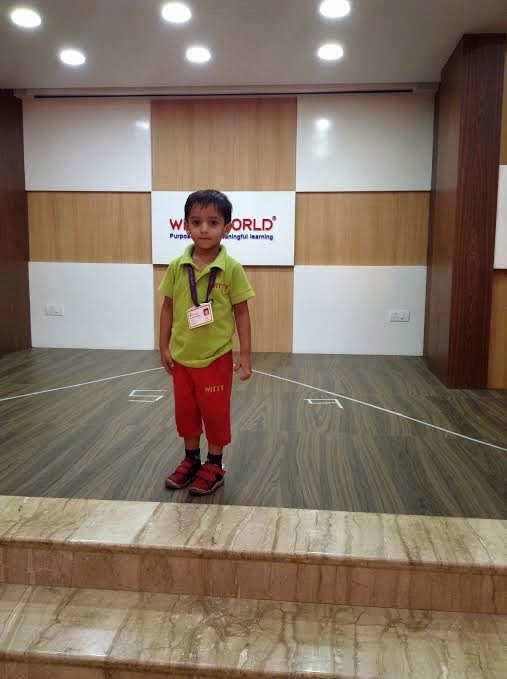 The little ones got a hands-on experience of being on stage and speaking confidently. It was truly a “learn with fun” experience for the students. The Children of Witty World, Playgroup section, went for a Field Trip on 27th March, 2015 to The Balwa's Garden.They were excited to see the Flowers in the garden and took pride in identifying the ones that they were taught about in class. They were thrilled to have an opportunity to explore nature, as they saw different flowers and trees with different colour leaves on it. They also enjoyed playing various games and singing along with their friends. They were very happy to experience nature so closely along with their friends and their teachers. The children had a great time as they learned, played and had fun. The garden is a familiar place tamed by humans to serve social purposes, but it has the potential to bring young children into meaningful contact with the diversity of nature and society. Childhood memories of contact with nature involve a deep sensory imprint of texture, smell, colour, sound, and taste. On Thursday, 26 March 2015, children of Playgroup section of Witty International School were taken for a field trip to "A Garden". Children enjoyed watching colourful flowers and got a firsthand experience about the natural world. It was a good learning and fun experience for young ones to see different types of plants and colourful flowers, as they enjoyed playing on the slides and swings with their friends. 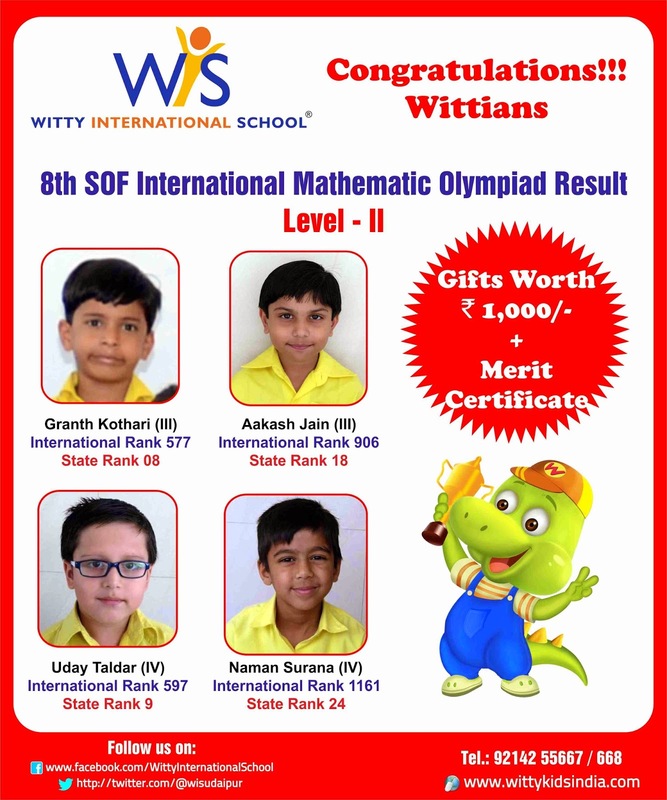 To appreciate and encourage good behavior, good performance and to recognize core competency skills and talents hidden within our students WIS is awarding stars under “Student Motivation Programme”. Under this the students are rewarded by Green Star, Red Star, Orange Star and WIS Star for their achievements in various fields. The programme is not merely focused on achievement of academic excellence but also focuses on 14 competency life skill areas. At the end of this year several students were awarded the Green, Red and Orange Stars. 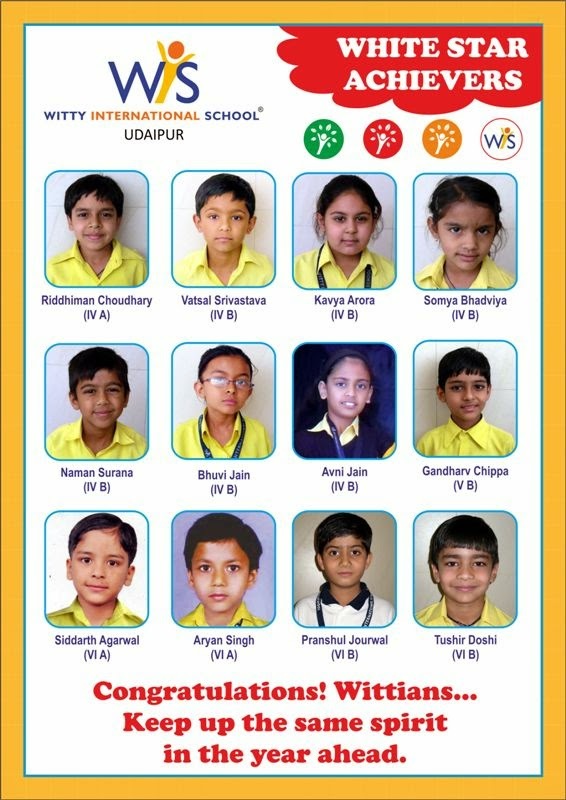 We feel proud to announce some of our WIS star achievers. 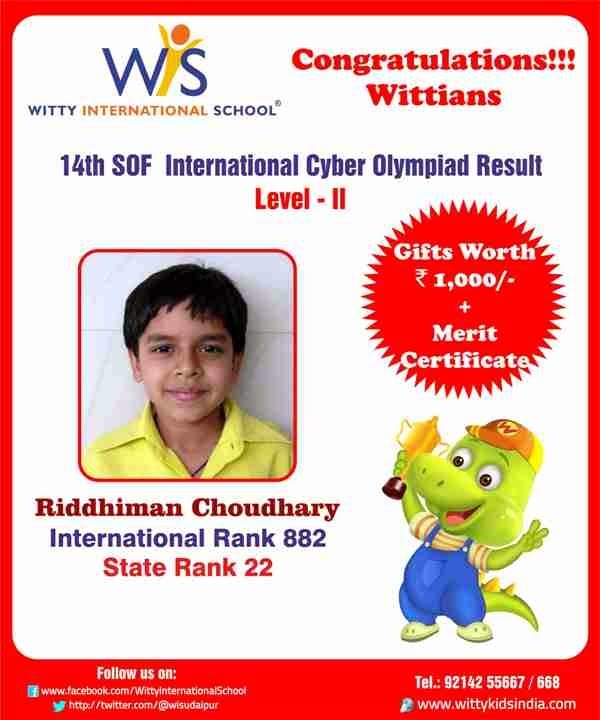 Founder’s Day is celebrated each year by Witty International School Bhilwara. It is a time for us to remember the contributions of our founders and celebrate accomplishments of staff. This year Founder’s Day was celebrated on Monday 23rd March.We took some time to reflect on our rich history that began 4 years ago. We paused to celebrate our rich past and promising future: the past as we honour the dedicated teachers who chased the dream of our director sir, who learnt from our most outstanding mentors to accomplish the great things for the future. Teachers performed various cultural programs and enjoyed a dance party followed by dinner. Principal Mrs Sadhna Mishra motivated the witty family to excel in all aspects of life, to integrate new perspectives and to lead at every opportunity. 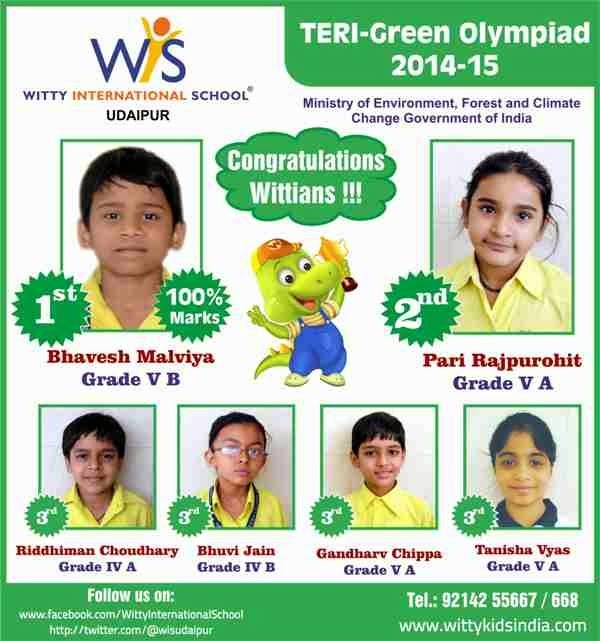 The GREEN Olympiad is an annual written examination on environment initiated by The Energy and Resources Institute (TERI) by the Ministry of Environment, Forest and climate Change Government of India and attracts participation from lakhs of school students across India and abroad. 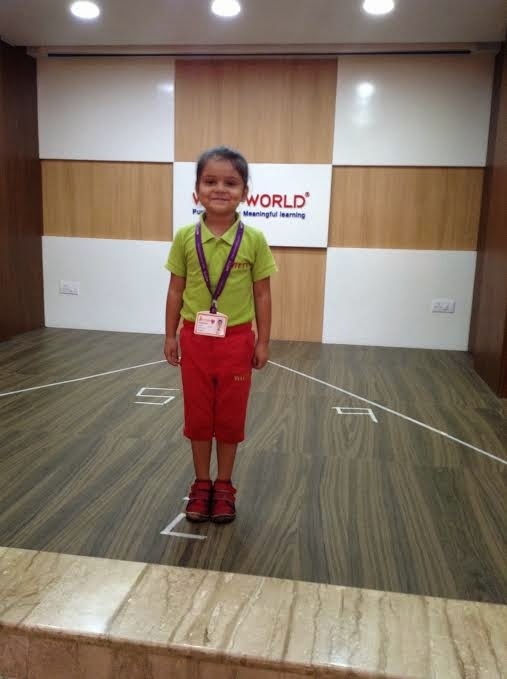 For the first time the examination was conducted for junior level for grade 4 and 5. 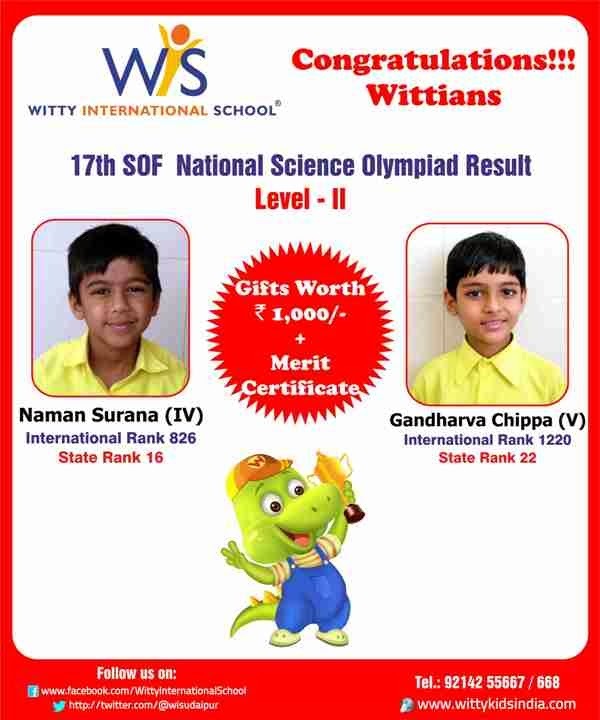 Seventeen keen, sharp and zealous junior Wittians appeared for the TERI Junior Quiz and came out with flying colours. The Outstanding Performance by Bhavesh Malviya, Grade V, scoring 100 and securing the first position in school has set a benchmark for all. Other students namely Shaurya Singh, Gandharva Chippa, Pari Rajpurohit and Tanisha Vyas of Grade V and Riddhiman Choudhary, Bhuvi Jain, Kavya Arora of Grade IV were awarded Certificate of Distinction for their excellent performances. The Certificate of Merit was awarded to Deetya Srinath, Taha Kanorwala and Shikhar Kataria. 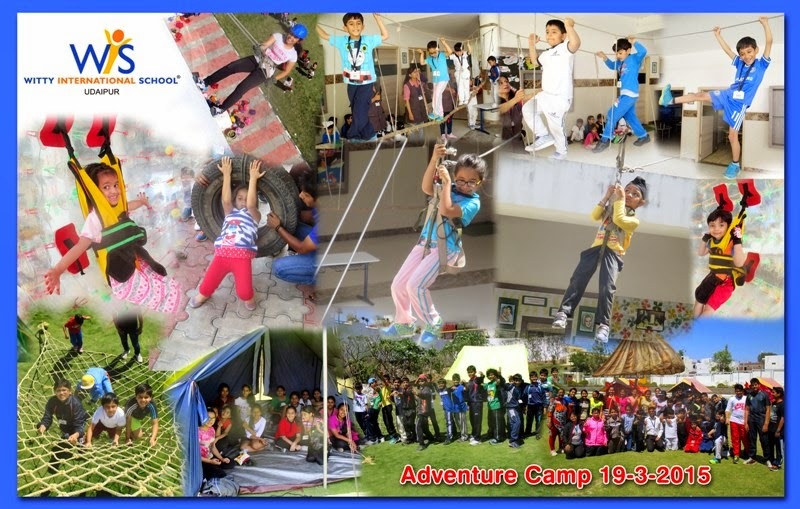 The school organized a two day adventure camp for students of Jr. KG to VIII on 19th & 20th March in the school premises. The students enthusiastically participated and thoroughly enjoyed the activities like Rappling, Climbing, Flying Fox, Burma Bridge etc. This adventure camp was a thrilling experience and developed confidence, discipline & self reliance in students. 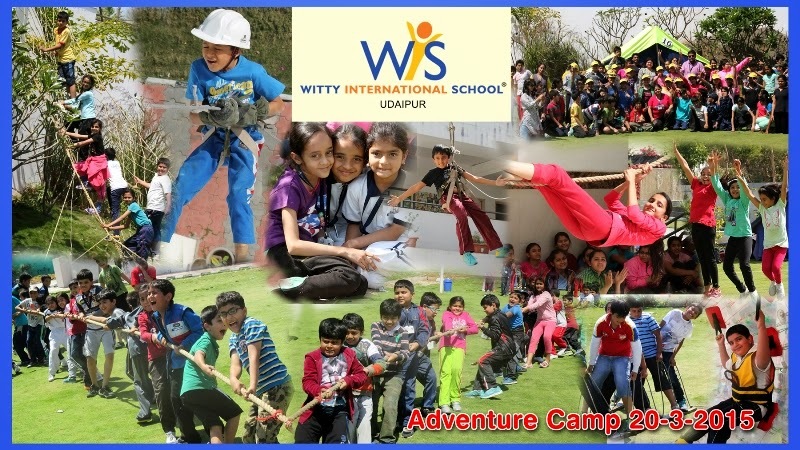 The camp was helpful in giving an opportunity to students to develop skills of interdependence within a group team spirit and helped them conquer their fear. The overnight stay infused in them a sense of responsibility and independence. Healthy food & delicious snacks were served to the students. The Camp ended with happy & delightful students coming out of school. 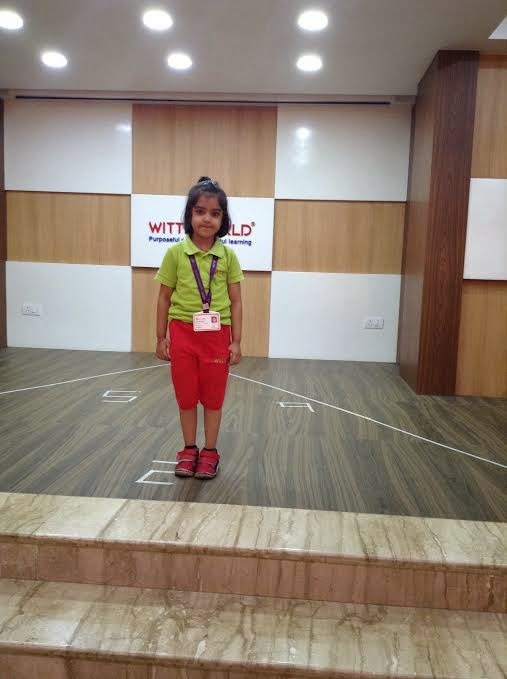 “One Two Buckle My Shoe” rhyme was enacted by children of Nursery section at Witty International School on Friday, 20 March 2015 with the help of Number flashcard, objects and actions. Our presentation of nursery rhymes has enabled the children to interact in both large and small group activities while reciting and acting out the rhyme. Through this teacher took recap of numbers and also raised the levels of self-confidence, as our shining stars became full participants. Children enjoyed enacting and reciting the rhyme. Kids always like to dress up and role play, and Poem enactment is the best way to do that. What makes it more fun for the children is when all their friends participate in this dramatisation. 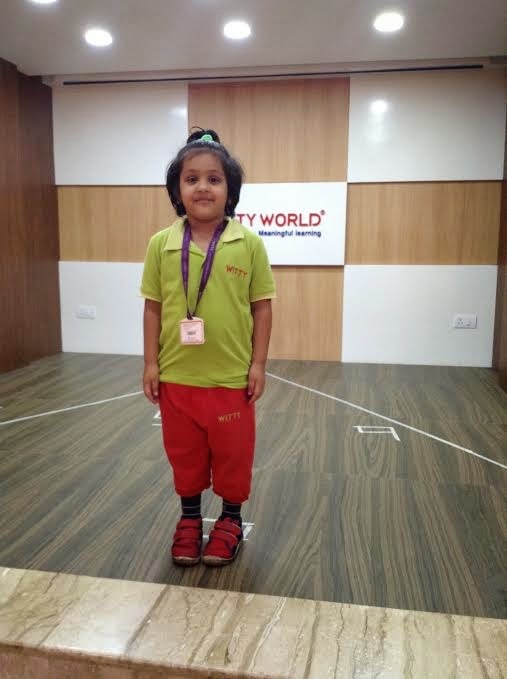 The children of Nursery class enacted the age old rhyme "One Two...Buckle My Shoe...". The children made this rhyme come alive in class today. All the children participated in this enactment, some being numbers and some being the objects. They were really excited to recreate this rhyme that they knew so well and they were so excited to play the various parts.